This week a second square for the birthday of the CAL – Crochet A Long Facebook group “Friends Around the World”. 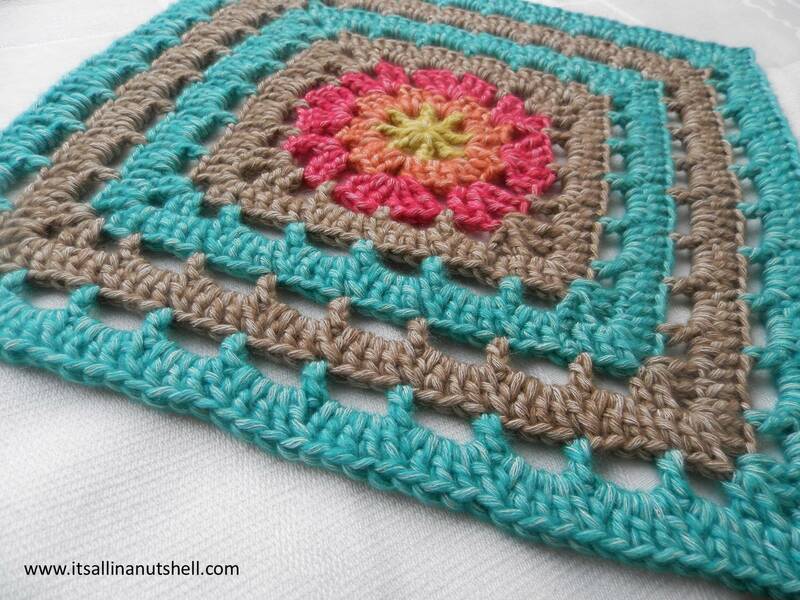 Last week I released my first afghan square “Stephan” which I named after my first born son Stephan. This week I show you my second square, and it will not surprise you that I have named this square after my second son Vincent. As an extra treat yesterday was Vincent’s birthday, so this square is like a belated birthday gift for him. Not that he is that keen on crochet, but it’s the thought that counts, right? In addition to the written pattern in US terms there are more resources available to help you make this square. I want to thank the CAL – Crochet A Long Translation Team for the translation. Please note that this pattern uses US crochet terms with the following abbreviations. dc2tog – two double crochets worked together where the first ‘leg’ of the stitch is in the ch-space currently working in and the second ‘leg’ is in the next ch-space, skipping the “post” (dc) between the ch-spaces. This way the dc2tog frames the dc post between the ch-space with a leg on either side. When I change colors in the pattern I do not indicate how you should make the first stitch of each round, you can chose if you want to use a standing stitch or an equivalent number of chain stitches. The choice is up to you. I usually do not indicate if you should close a round with a slip stitch or an invisible join, again this choice is up to you. When I do indicate to join in a certain way this is to make the stitches of the next round easier to do. When counting stitches, the ch2 corner stitches do not contribute to the final stitch count. Only the stitches between the ch2-corner spaces are counted. Unless indicated otherwise, start each round in a ch2-corner space. When relevant I will add an extra tip in (italic brackets). If you find the written pattern hard to follow, you can follow the video tutorial in which I show step by step how to make “Vincent”. ch4, close with a sl.st. to the first ch. ch4 (counts as 1tr), ch1, in the ring work 1tr, ch2, (1tr, ch1, 1tr, ch2) times 3, close to the top of the ch4. [(2dc, ch2, 2dc) in the ch2-corner space, skip the next tr, (2dc, ch1, 2dc) in the ch1-space, skip the next tr] times 4. Close to the first stitch. [(2tr, ch2, 2tr) in the ch2-corner space, ch1, skip the next 4 st., (3tr, ch1, 3tr) in the ch1-space, ch1, skip the next 4 st..] times 4. Close to the first st.
[(2tr, ch2, 2tr) in the ch2-corner space, ch2 and skip next 2 tr, 1dc in ch1-space, ch3 and skip next 3 tr, 1hdc in ch1-space, ch3 and skip next 3 tr, 1dc in next ch1-space, ch2 and skip next 2 tr] times 4. Close to the first stitch with a sl.st. Use the same color yarn as in round 4.
ch3 (counts as 1dc), 1dc in last st. before ch2-corner space. [(2dc, ch2, 2dc) in ch2-corner space, 1dc in next 2 st., 2dc in ch2-space, dc2tog, (3dc in ch3-space, dc2tog) times 2, 2dc in last ch2-space, 1dc in last 2 st.] times 4 omitting the last 2dc. Close to the first stitch. [(2dc, ch2, 2dc) in the ch2-corner space, ch2, skip 2 st., 1dc in next st., (ch3, skip 3 st., 1dc in the next st.) times 4, ch2, skip the last 2 st.] times 4. Close to the first st. with a sl.st. Use the same color yarn as in round 6. [(2dc, ch2, 2dc) in ch2-corner space, 1dc in next 2 st., 2dc in ch2-space, dc2tog, (3dc in ch3-space, dc2tog) times 4, 2dc in last ch2-space, 1dc in last 2 st.] times 4 omitting the last 2dc. Close to the first stitch. [(2dc, ch2, 2dc) in the ch2-corner space, ch2, skip 2 st., 1dc in next st., (ch3, skip 3 st., 1dc in the next st.) times 6, ch2, skip the last 2 st.] times 4. Close to the first st. with a sl.st. Use the same color yarn as in round 8. [(2dc, ch2, 2dc) in ch2-corner space, 1dc in next 2 st., 2dc in ch2-space, dc2tog, (3dc in ch3-space, dc2tog) times 6, 2dc in last ch2-space, 1dc in last 2 st.] times 4 omitting the last 2dc. Close to the first stitch. [(2dc, ch2, 2dc) in the ch2-corner space, ch2, skip 2 st., 1dc in next st., (ch3, skip 3 st., 1dc in the next st.) times 8, ch2, skip the last 2 st.] times 4. Close to the first st. with a sl.st. Before continuing, take a moment to measure your square. Based on your personal tension you might have to replace the dc in this round for hdc or tr to get to exactly 12 inches. Use the same color yarn as in round 10. [(2dc, ch2, 2dc) in ch2-corner space, 1dc in next 2 st., 2dc in ch2-space, dc2tog, (3dc in ch3-space, dc2tog) times 8, 2dc in last ch2-space, 1dc in last 2 st.] times 4 omitting the last 2dc. Close to the first stitch with an invisible join. 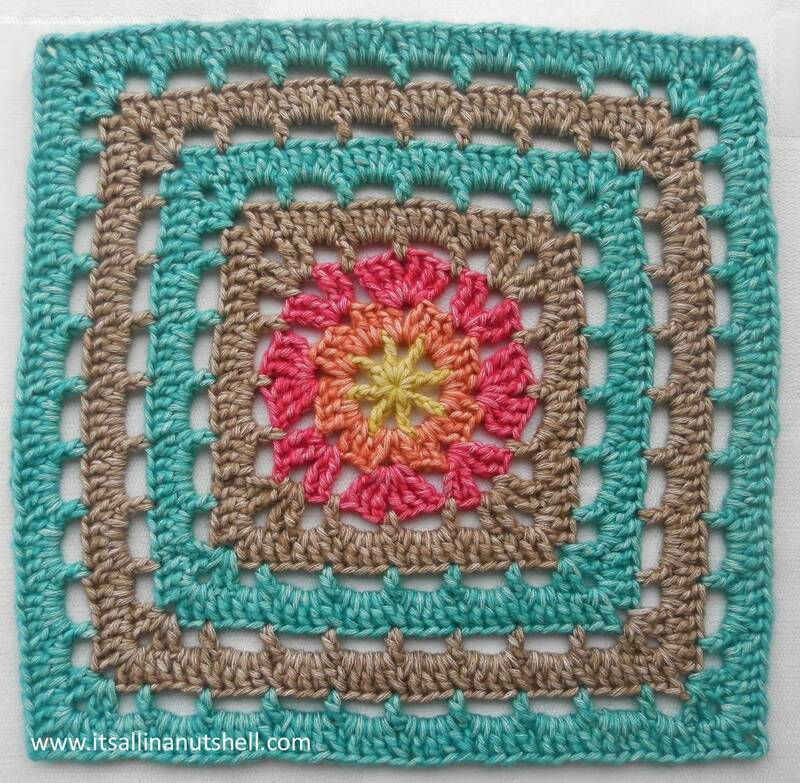 When you have completed your square, block it to 12inches (30cm). And then you are all done! Lovely! Really unique granny square!